The Dacia Duster dates from the bad old days when Romania was part of the Communist Bloc and all motor manufacturers were owned by the state. It was the result of collaboration between ARO (who had built Soviet GAZ 4x4s under licence in Romania since 1964) and Dacia (who had close links with Renault and had been building some of the French company's products under licence since 1966). The collaboration between the two produced a recreational 4x4 which made its debut in 1979 under the title of the ARO 10-series and used Dacia built Renault engines. 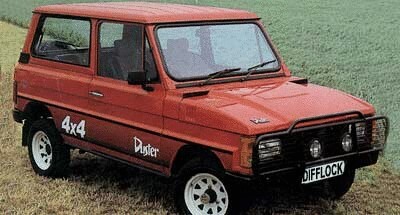 Sold in other European countries as AROs, these came to Britain as Dacia Dusters in 1985. The Dacia name was chosen because Britain was already familiar with the Dacia Denem, a licence-built Renault 12 introduced in 1982. The history of the Duster in Britain has been plagued by problems with the importers. Plans announced to bring the vehicles in during 1982 were held up when the first importers ceased trading; there was a hiccup in autumn 1990 when the new importers gave way to a third company; and then imports ceased in 1993, apparently permanently. The last Duster was sold in Britain in September 1993, but the vehicle remains available in Romania and in other European countries, as the ARO 10-series. As a result, the Duster does not enjoy a good reputation in Britain. Fundamentally, however, it is a soundly-conceived lightweight 4x4 aimed at the cheap end of the recreational market.